The aptly-named album ‘Delirium’ opens with the melodic and seriously heavy ‘House of Shame’ that many will wonder, ‘Wait! is this Lacuna Coil? ?’ But it is, man it so is. We hear Andrea Ferro, roaring likes he’s possessed, and then Cristina, almost operatic with her angelic vocals. The music is big, bold, and seriously heavy metal. When it’s over I’m breathless and a little stunned. It doesn’t stop though. ‘Broken Things’ kicks in with a powerful opening from Andrea, and it takes a beautiful melodic verse from Cristina, that is reminiscent of the music on their 2002 album ‘Comalies’, to remind me of the band’s legacy on which this song is built. The music is complex and layered; there is the familiarity of some of the bands older style, but with an aggression we have never heard. The title track ‘Delirium’ with its simple repetitive vocals is thoroughly addictive and it’s easy to see why the song was released as a single. Placed here, after the opening heavy tracks on the album, it has heightened context and weight; re-enforcing the bands vision for the album. I defy anyone not to find themselves humming this track after hearing it. ‘Blood, Tears, Dust’ maintains the albums signature aggression, mixing electronic tones with a very modern metal sound and complex guitars and drums. It’s twisted and experimental. The overall tone of the song, and the album, of is one of a loss of control and one has to wonder if the band somehow lost control of this beautiful creation as it grew a life of its own during its recording. For many, Lacuna Coil music has been built on strong melody and in ‘Downfall’ the band prove that they are the masters of the art. The song is chillingly beautiful and raises the hairs on my arms every time I hear it. I’ll admit it, the song brought tears to my eyes when I first heard it and I think this song will please many that remember the early Lacuna Coil albums with fondness; it wouldn’t be out of place on Unleashed Memories. This feels like a deeply personal song and the execution is astonishing, including a great solo by Alter Bridge musician Myles Kennedy. I could go on about each of the songs, but that would be unfair. You have to discover Delirium for yourself. Though I should mention that there’s also a cover song on the bonus version so well re-imagined that you may not recognise it as such. It’s also chillingly awe-inspiring. For a band releasing their eight studio, this is bold, fresh, genre expanding metal, and I’m left with a strong feeling that this is Lacuna Coil challenging themselves and their listeners’ expectations about what this band is all about. In Delirium nothing is safe and I think it’s going to surprise many. This is very heavy metal, and may even be too heavy for those used to gothic tones that we’ve heard in the past. There is melody throughout, but Delirium is NOT about ballads; this is dark, experimental, and twisted music. It’s also utterly compelling. Lyrically, and musically, Lacuna Coil have embraced a new kind of madness verging on genius. Both singers excel, never have the ‘beauty and the beast’ lyrics been more evident – especially with Andrea’s brilliant growling, and with Cristina showing such a range of vocal beauty. Both sing like they are possessed and percussionist Ryan takes the aggressive sound to new level with his perfect drumming. Marco has proven himself again to be a musical genius and his creativity shines throughout the song-writing and guitars. 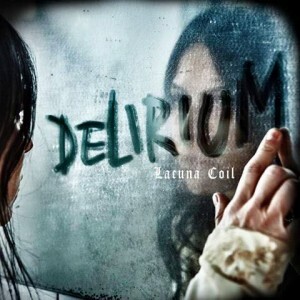 If you’re a Lacuna Coil fan, listen to Delirium – it will surprise you and, if you’re like me, delight with its direction. If you’re a Metal fan, listen to Delirium, I think you’ll find this the axe that has smashed down the door of your expectations with a madness that is unmissable. Excuse whilst I lock myself into a dark room and lose myself again in this.